Blend greens and water first, then add all remaining ingredients and blend again. For optimal health, you'll want to make sure everything is organic; here's why. An easy way to enhance your detox, or add some veggies to your day! Add everything to a blender, blend well, and enjoy!! If the ice makes it too thick, feel free to add more water. If you want a smaller drink, omit the ice and blend well. Enjoy chilled or over ice. Healthy Life Tip: avoid making this (or anything like it) into a juice via a juicer or strainer. You'll want to consume all of the nutrients and fiber found in the pulp that will be thrown away if turned into a juice. The goal is to "eat" the whole cucumber, celery, lime, etc. The perfect way to add a cucumber to your day! Healthy Life Tip: avoid making this (or anything like it) into a juice via a juicer or strainer. You'll want to consume all of the nutrients and fiber found in the pulp that will be thrown away if turned into a juice. The goal is to "eat" the whole cucumber, lime, etc. 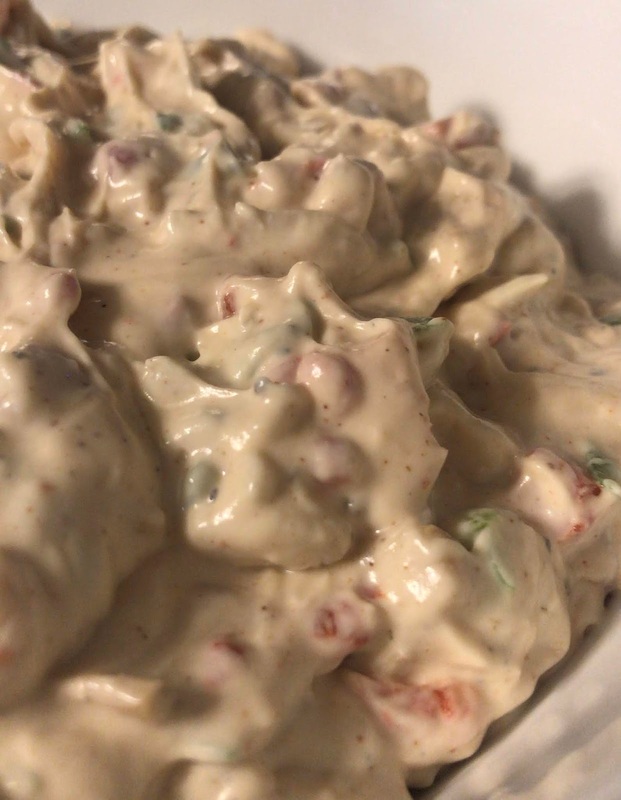 The BEST Vegan "Crab" Dip Ever. This may easily be one of my favorite dips of all time. you won't be able to stop making this and sharing it with everyone you know. Best if prepared the night before, or has a few hours to sit before serving. First, mince the garlic, then drain and chop the heart of palm into varying shapes and sizes to act as the crab in the dip. Don't worry if some starts to shred, as you sautee it this will happen to some pieces and that is perfectly fine. Next you're going to sautee the garlic and heart of palm in the olive oil over low heat until the heart of palm browns. Keeping the heat low, allow this to occur as you prep the remainder of the dip, stirring with a spatula occasionally. For the next steps - if you're short on time, you can just add all of the ingredients (except Old Bay) together in a bowl while the heart of palm sautees. But, I find doing it in the following order allows the seasonings to flavor the cream cheese and mayo base the best. First add the cream cheese and mayonnaise to a large mixing bowl and combine together. Then add the Worcestershire sauce and lemon juice and mix well. Next, add all of the dry ingredients (except the Old Bay) to the dip, mix together well, then set aside to marinate while you prep the rest of the ingredients. Dry Ingredients: paprika, oregano, onion powder, garlic powder, ground black pepper, cayenne pepper, freshly ground sea salt. Head back over to the heart of palm, add a light dash of Old Bay Seasoning and a grind of pepper, stir together well, and continue to let brown. Next, dice all the veggies (red bell pepper, red onion, green onion, pimientos), and add them to the dip as well and stir together. By now your heart of palm should be almost ready. Add another dash of Old Bay and continue to sautee until ready. Then remove from the heat and let cool. Once cooled, fold the heart of palm into the dip and mix together well. I enjoy serving this dip cold after it's had the chance to sit for a few hours first, or overnight, but sometimes it's just too hard to wait! Enjoy!